Mashing up images is engaging. The images can be funny, beautiful, informative or whimsical. You’ll find that you will intrinsically care about making your mashups look the way your want. And in order to do that with Fraction Mash, you directly manipulate the fractions that control the way the pictures are partitioned. Attend closely to the fractions themselves, and develop a deep intuitive understanding of fractions. One important concept that you will explore is the relationship between the size of the denominator and the size of the fraction. As the denominator increases, the value of the fraction decreases. This might seem like a simple thing, but it often defies expectations of how numbers work. For many, this can become a barrier to understanding fractions. With Fraction Mash, if you want smaller pieces, you have to manipulate the fraction itself and make the denominator bigger. 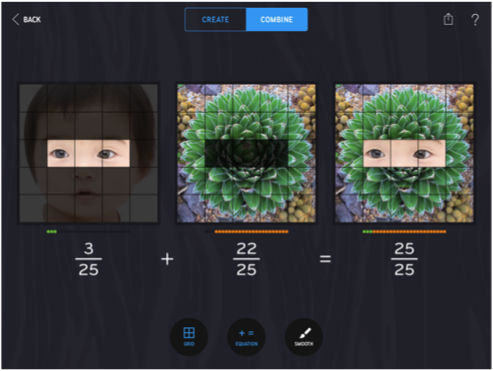 The variety of grid options in Fraction Mash breaks free of rigid preconceptions of how fractions are represented. Rather than constantly associating certain fractions with a singular representation (e.g., only thinking of thirds in terms of pie slices), you can choose the way they view that fraction by choosing a new way to slice the image, and then choosing a new arrangement of parts. When you compare mashups, you might have used the same fractions, but it’s likely that mashups look quite different. Using Fraction Mash can help develop the ability to switch fluidly between different visual representations of fractions. The concept of the “whole” is important to consider in each activity with Fraction Mash, and with any use of fractions at all. If you have 3/4 of something, you’ll want to know “3/4 of what?” For the purposes of this app and most of the activities, the “whole” is the picture itself – the image that fits in the frame. So pieces of one picture combine with pieces of another picture to make one whole picture: the mashup. When you look at a mashup in Combine mode, tapping “Equation” will show you this idea explicitly. Above, 3/25 of the baby picture plus 22/25 of the plant picture equals the whole mashup. You might be tempted to speak casually and say that this image represents adding 3/25 of the baby to 22/25 of the plant, but that’s not really exact. The baby doesn’t fill its entire picture. There’s plenty of background around the edges. The fraction beneath that picture does not refer to 3/25 of the baby’s head. Rather, it refers to 3/25 of the picture within the frame. When you verbalize their thinking around Fraction Mash activities, they might express confusion related to this point. You can use this as an opportunity to address the convention that Fraction Mash uses to refer to the picture itself as the whole. It will help to be grounded in what the numbers mean as you create more and more complex mashups. One activity, Paraffe, Pandaphant, Penghorse, explicitly asks students to re-define what the “whole” is. 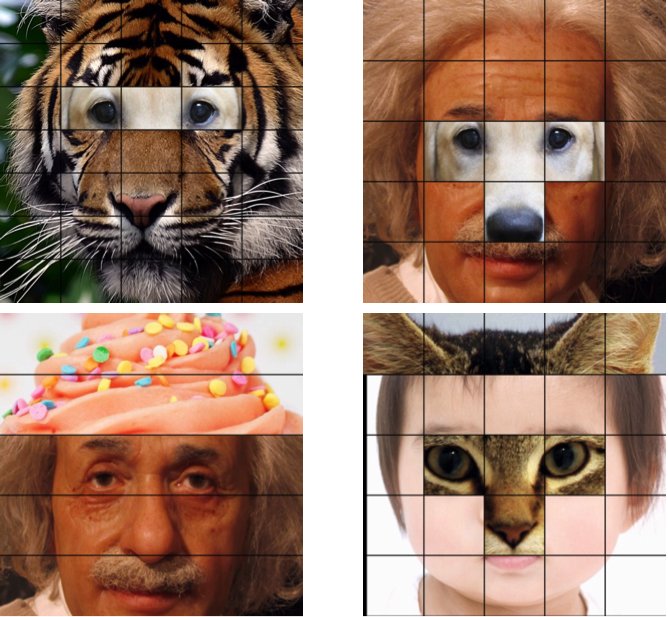 In this activity, you graft part of one animal’s picture to part of another animal’s picture, creating a new, hybrid creature. For instance, you might use pictures of a parrot and a giraffe to make a creature we might call a paraffe. The questions asked by this activity are “What fraction of the paraffe is parrot? What fraction of the paraffe is giraffe?” To answer, you need to think of the “whole” as only the part of the picture that contains the paraffe, not the entire picture. This is a perfectly reasonable use of fractions, but it uses a different convention than the rest of Fraction Mash. You will not be able to simply read the numbers from the Equation view to find the answer. You’ll need to reason through what the fractions actually mean. Asking to explain how you made your mashups gives a chance to verbalize mathematical thinking. Using the Tell The Story feature of Fraction Mash lets you easily create written reports of their mashups. We are often eager to share the tips and tricks they used to make their mashups just right, and others are just as eager to learn them. Lively discussions about mashup methods are rich opportunities to surface misconceptions and to correct them. They also give everyone a chance to explain the math they know, which helps cement new understanding. Here’s a brief tutorial to get you started with Fraction Mash.